Mr. Sunderraman is an engineering graduate from IIT Madras and a postgraduate in management from IIM Ahmedabad. He began his career with Godrej group in 1980 in the marketing field. Over the 32 years, he worked in manufacturing, quality, strategic planning, logistics, sourcing, supply chain, project management office and innovation through varied assignments. In the last few years, he has had a wide-ranging exposure through seminars, missions and workshops in the field of supply chain, strategic management, quality and innovation. He is actively involved in several nationwide initiatives of the Confederation of Indian Industry. 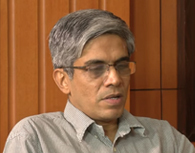 He is a visiting faculty in many Management Institutes. Currently he is driving the corporate initiative on Breakthrough Management and Disruptive Innovation (DI) in several businesses across Godrej, working closely with Prof Shoji Shiba who has been associated with the globally recognized Leadership for manufacturing program in MIT and Prof Clayton Christensen of Harvard Business School. He is active in the CII Innovation Mission initiative and is the part of the core group of Module Directors for Visionary Leadership for Manufacturing program (VLFM)- an Indo-Japan collaborative initiative. He has been personally spearheading the ‘Chotukool’ small cooler project as the Corporate Leader of the DI initiative. Godrej and Boyce Mfg. Co. Ltd. manufactures and markets refrigerators; washing machines; air conditioners; office furniture; home furniture; security equipment for banks (such as safes, strong room doors, bank lockers, etc.) and for commercial establishments and homes; locks and latches, forklift trucks and warehousing equipment; process equipment for chemical, petrochemical, refineries and allied industries; precision tools for sheet metal, zinc, aluminum and thermoplastics; real estate development. The Godrej group enjoys significant leadership position in home appliances, consumer durables, office equipment, industrial products, consumer products and services.